Agent 99: Max, what did you do? Maxwell Smart: Just eliminated a Kaos agent. Agent 99: Well, how could you be sure? Maxwell Smart: Because, 99, my eagle eye picked out a few things that the ordinary person might not see. First of all, his sponge was absolutely filthy. Second, he was using horizontal strokes instead of vertical strokes. And finally, he was holding his squeegee with an overlapping lacrosse grip. Agent 99: Besides, it’s raining, and window washers don’t work in the rain. Maxwell Smart: I wasn’t finished, 99. Maxwell Smart: Besides, it’s raining, and window washers don’t work in the rain. Agent 99: Good thinking, Max. Her talents as a spy are numerous. She won three straight Lamont Cranston Awards for Shadowing. She speaks Chinese, German, and French. 99 is an accomplished dancer, as well as a violin and harp player. In several episodes 99’s cover is that of a singer and she reveals herself to have an excellent voice. Remarkable too was the presence of 99 — an independent, single girl who worked for a living and was obviously brainier, tougher and stronger than her male partner. Although these facts were often the basis for jokes, and 99 was given normal, healthy dreams of matrimony, the character provided a positive television image for feminism. Barbara Feldon received numerous letters from women who saw the character as an encouraging role model. It is notable that 99 seldom killed anyone directly. While Max was quite happy to shoot an adversary onscreen, 99 was more likely to knock out or elude a pursuer — arguably a more skilled and less wasteful method. She was in need of rescue more often than her partner, but she saved his bacon on numerous occasions, handled a gun competently and utilized quick thinking and karate chops. “Get Smart” represented emancipation for women as well as for the sitcom. 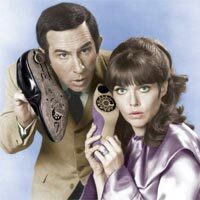 The show made fun of the ultra-suave spy characters of its day by making those archetypes more accessible to the average Jane and John TV-watcher. Agent 99’s acceptance of Maxwell’s failings as endearing communicated that a man doesn’t have to be suave 24/7 in order to have appeal as much as her existence subverted stereotypical female roles. Agent 99 was a great multi-dimensional character even for a comedy, a genre that has a tendency to get laughs from stereotypes. She had a dangerous job she loved and excelled at, and yet never lost the ability to connect to other people. Eventually 99 and 86 married, had twins, so in many respects 99 was one of the first working mothers who chose to work rather than as a response to the absence of a bread-winning male. I mean, someone had to keep Maxwell alive, right? This one’s for my favorite Jedi.